If all ye proud Mac owners (iMac, MacBook Pro and MacAir) still think viruses, trojans and malware are only destined at the lesser mortals inhabiting the Windows world, it’s time to get out of that la-la land state of mind. The success of the Mac OS X platform – the Mac Minis, iMacs and MackBook Pros – in recent years means virus and trojan authors are working overtime to turn your pricey Apple computer into a piece of junk. In 2012, the biggest malware for Mac systems was the Trojan downloader Flashfake, which accounted for over 50% of the attacks targeted at Mac systems. A Flashfake botnet consisting of 700,000 computers running under Mac OS X was discovered in the early 2012. Cybercriminals in Eastern Europe and Russia also unleashed targeted attacks on influential politicians and prominent businessmen to access information stored on their computers. 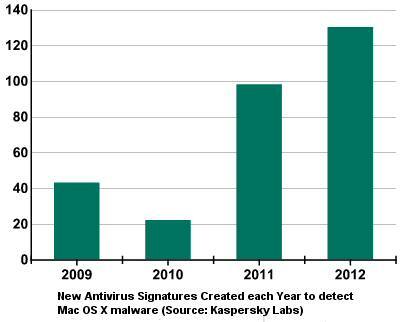 Security software firm Kaspersky Lab created 30% more signatures in 2012 to detect various Mac Trojans compared to 2011. If you go back to 2010, the number of signatures created annually has increased six times. Other security software firms are working overtime on bolstering the defenses of the Mac systems to the malware threats. Here are some steps you can take to minimize the chances of your Mac computer being hit by one of those deadly malware and causing you considerable grief. * Disable Java on the entire Mac OS X. First, open the Applications folder, and then the Utilities folder. Next, launch the “Java Preferences” application and uncheck the box next to “Enable applet plug-in and Web Start applications. Finally, make sure you also uncheck all the boxes next to “Java SE #. * Install Macupdates from Apple and always keep your system up to date. * Install updates to Acrobat Reader (PDF reader). * Download only from secure/trusted sources. * Install a free utility like Ghostery to prevent redirects from search engine results or from links to malware hosting sites. * Get a security software from Sophos, Kaspersky, Norton or one of the other vendors. * Create strong passwords of at least 10 characters to login to the machine after bootup. Passwords should be a mix of alphabets, numbers, punctuations or use symbols above the number keys ($, @, # , * etc). * Avoid automatic logins for any application on your Mac. * Disable automatic opening of downloaded files. Open Safari preferences on your Safari browser and click the General tab. Then, uncheck the box next to Open ‘safe’ files after downloading. * Avoid “sharing” by clicking on the “System Preference” icon and then selecting “Internet and wireless.” Now, select the “sharing” tab and uncheck everything in the box to the left. * Encrypt your drive via the FireVault 2 feature available on OS X Lion and Mountain Lion. FileVault 2 is managed via the Security & Privacy preference in System Preferences of your Mac. The Apple web site has a good overview on setting up FireVault 2 encryption. There’s no guarantee that your Mac will never be hit by a virus or malware but by taking the above steps you’re significantly reducing the odds of disaster. Major Internet Security Threats in 2013 Is Developing Apps for Apple iOS a Losing Proposition?